Report from e-Culture Fair | JONAH BRUCKER-COHEN, PH.D. Report from e-Culture Fair – JONAH BRUCKER-COHEN, PH.D. Although adding the letter “e” to words like “culture” might seem a bit too 90s, the 2nd E-Culture Fair (first was in 2000) lived up to its name as a comprehensive showcase of over 50 projects, experiences, and performances that combined the virtual and physical. The fair, which took place in Amsterdam, was spread over several venues into three distinct categories including “My-Mode” (wearable technology and fashion), “Mobile Home” (networks at home and dispersed in urban settings), and “Toys4Us” (gaming and playful interfaces). This fair’s theme centered on “Research and Development” in new media and took a hands-on approach to showing work with an eclectic mixture of live demos and events. Despite the potential brain overload, I managed to tour most of the venues and even sit in on several project presentations. Walking into the newly renovated Paradiso theatre, My-Mode resembled a hybrid fashion show turned trade fair. The setup consisted of a wide range of fashion tech hybrids that emphasized the integration of technology on the body in everything from fabric design to reactive clothing. Taking a playful approach to adverse weather conditions was Elise Co’s “Puddle Jumper”, a raincoat with electro-luminescent panels that lit up when water fell on the coat. Also on display was International Fashion Machines’ “Electric Plaid”, a panel of interwoven conductive thread and silk-screened thermochromic inks that slowly changed colors when electricity was applied to the thread. This demoed solid technological know-how, but less interesting implementation other than some sewn light switches and pretty wall mounts. 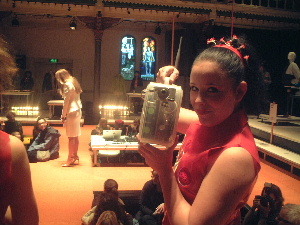 On the more practical side was “Inside/Outside”, a series of networked handbags that measure localized pollution (smoke, audio, exhaust, etc…) and connect to each other over an ad-hoc (or spontaneous) network to exchange data and aggregate a diary of exposure levels over time. Focusing on biometric feedback was Sompit Moi Fusakul’s “Interactive Ornaments: Emotions in Motions” which measured the wearer’s heart rate and transposed this result on kinetic and illuminated jewelry. Also included was Jenny Tillotson’s “Smart Second Skin”, a dress that emits odors depending on biometric feedback from the wearer. I got really close and out came a Whiskey smell which means that either I remind people of drinking or the day was getting too long. Despite the wide array of perspectives presented in MyMode, there seems to be a continual emphasis on cause and effect relationships with wearable technology. Something happens in the environment, space or activity the wearer is engaged and the clothing or device acts as a display or highlights these actions. The next step might be to look at reciprocal relationships between the object and the wearer where each plays a crucial role in each other’s development and output over time. Is it possible to create objects and clothing that are not only aware of their inhabitants, but also of each other? Escaping the confines of indoor space, wireless-based projects seemed to pervade the fair. Delivering mobile wireless hotspots was Shu Lea Chang’s “RICHAIR”, featuring three wired up roller skate girls carrying mobile 802.11b repeaters and mini-computers with embedded webcams for relaying network connections and images across town. There was also an emphasis on the social impact of technology through Doors East’s “Mapping Mobile Phone Usage Among Auto Rickshaw Drivers”, a project examining the changes mobile technology has had in Bangalore, India for taxi drivers. The main implementation would be to create a mobile phone booth by integrating a pay system into cell phones integrated into the rickshaws. Finally, Marc Tuters’ “Geograffiti” project envisions a future of collaborative cartography based on localized information exchange where public ‘digital’ space is annotated with graffiti. Moving onto the playful side of technology, the “Toys4Us” exhibit looked at everything from collaborative DJ scratching and virtual puppetry to public installations of shared stories. Marcus Kirsch’s “Rashomon” pit video capture with Street Fighter gaming where visitors’ kicking and punching moves were captured and imported as game characters into a two-player fighting match. Also integrating public input was Merel Mirage’s “Holy”, a networked vending machine with an embedded LCD screen that allowed visitors to www.holy.nl to author animations and send them to the display. Also STEIM showed up with some impressive MIDI instruments and sound experiences including a pair of headphones with tilt sensors that sped up beats-per-minute on the audio depending on how fast you shook your head. After two full days of demos and talks, questions arose as to the cyclical nature of information and interface design. On one hand there is a trend to build interfaces that encourage social interaction, but there’s also a tendency to create experiences that discourage chance occurrences by highlighting personal experience. There should be a way to balance experiential design so that it not only allows for collaboration but also maintains an ambient presence that blends seamlessly into everyday activity. This was evident in some of the projects at the fair, but most had trouble escaping their categorization. Nevertheless, events like the E-Culture Fair are great for encouraging cross-pollination of research and practice along with showcasing the current state of the field. By emphasizing interactivity and the participatory nature of projects, the event had a distinct science fair-like atmosphere. This approach succeeded in presenting not only the latest gadgets and whimsical interfaces to come, but also the experience of participating in this landscape.